In 1994 Tom Bourke was jailed for life the murder of two UK Department of Transport inspectors at a garage near Manchester. Bourke, who is hoping his name will soon be cleared, has written to Sputnik journalist Chris Summers from jail. In a letter from Frankland prison in the north of England, Bourke said the Criminal Cases Review Commission was still reviewing the submissions his solicitor had made in 2015. "They told the solicitor just before Christmas it was the largest case they are reviewing…(they said) by March they should know whether they are going to refer it or not," he told Sputnik journalist Chris Summers. Bourke is serving life in prison for the murder of Alan Singleton and Simon Bruno, who were gunned down as they sat in an office at Chestergate Autos in Stockport, on the afternoon of November 22, 1993. Bourke, who has spent almost 25 years in jail for the crime, insists he is innocent and was never a cold-blooded gangster. "I've only met Tom twice by videolink but I've been impressed by his demeanor, his calmness and reasonableness. He has been a Category A prisoner for 25 years and has never had one disciplinary problem with an officer or another inmate. That is utterly remarkable for a Cat A prisoner," his solicitor Jane Hickman told Sputnik. "I don't understand how the supposedly dangerous gangster he was at the time of his arrest turned into this gentle, law-abiding guy who never fell out with anybody in jail," she told Sputnik. "We have a host of material which suggests he did not commit this murder and the process of justice miscarried really badly," Ms. Hickman told Sputnik. She has passed a file on the case to the Criminal Cases Review Commission (CCRC) which is expected later this year whether to refer the case back to the Court of Appeal. Ms. Hickman said it was a "hugely complex" case and she has 50 Lever Arch files in her office containing thousands of documents pertaining to the case. She said it was reminiscent of the Hillsborough disaster case in some respects. Mr. Singleton and Mr. Bruno were killed with a shotgun and the gunman, who wore a mask, fled in a red Ford Sierra car. At the time of the murders Tom and his brother Walter owned a chain of "quick-fit" garages in the Stockport area and the prosecution claimed they bore a grudge against Mr. Singleton and killed him because he was about to withdraw their licenses to carry out MOT tests — an annual car check which is mandatory for UK motorists. Bourke's sister Jo Holt said that so-called motive was completely "spurious". "Thomas's solicitor had written to Singleton and he knew he was in the right. There was no way he'd get his solicitor to write a letter and then kill the man," Ms. Holt told Sputnik. To this day nobody knows why the two men were really killed but Ms. Holt said the jury was never told about another line of inquiry which centered around a corrupt police officer. Towards the end of Bourke's trial at Manchester Crown Court there was a sensational development which he and his family insist changed the course of events. A gun had been smuggled into Strangeways prison in Manchester and an informant claimed it had been brought in so that Bourke could shoot his way out of jail. The local television news reported heavily on its discovery over a weekend a few days before the end of the trial. By the time the jury returned to court and the judge began summing up security had been stepped up considerably with armed police escorting Bourke and snipers on rooftops. 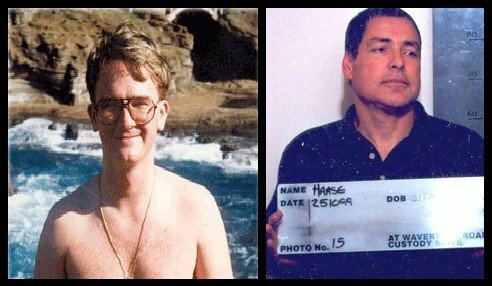 It was only many years after Bourke was found guilty and jailed for life that it was discovered that the gun had actually been smuggled in on the orders of a Liverpool gangster, John Haase, and had nothing to do with Bourke. Haase, who was secretly given the Royal Prerogative of Mercy by Home Secretary Michael Howard in 1996 and released early from a sentence for drug smuggling, was jailed for 22 years in 2008 for perverting the course of justice. The CCRC has the power to interview jurors from the original trial to find out if they were influenced by the TV news coverage and the heightened police presence. In his letter Bourke said he was in good health, walked in the exercise yard for an hour a day five times a week, went to the prison gym and did yoga in his cell. His sister visits him regularly and said he remained positive he would one day be released by the Court of Appeal and have his conviction quashed. "He prays to God the truth will out. He is more positive than me. In prison some people get down in the dumps but he has a strong mental attitude and it has got him through all these yewrs in prison," Ms. Holt told Sputnik. Ms. Hickman told Sputnik she believed the March 2018 dated mentioned by the CCRC was optimistic but she said she hoped there would be a decision "by the summer".